Usually build a new nest every night but may occasionally reuse one. Use leafy branches to shelter themselves from rain and sun, sometimes even draping large leaves over themselves like a poncho. Primarily eat fruit, but also leaves, flowers, bark, termites, ants and other insects. 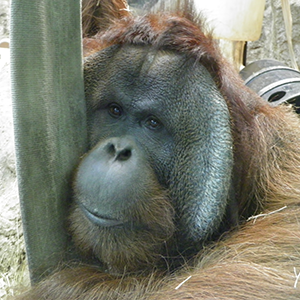 Use your smartphone to help save wild orangutans. Download the new Sustainable Palm Oil Shopping App. The App lists more than 5,000 products whose manufacturers are certified by the Roundtable on Sustainable Palm Oil (RSPO). Purchasing products from these companies saves orangutan habitat and lives.